Apple introduced a shocking new dock connector to pair with its new iPhone 5 during the phone's reveal Wednesday: the eight-pin Lightning. According to Phil Schiller, Apple's senior vice president of worldwide marketing, there hasn't been an iPhone dock connector change in nine years. The phones have always used iPod connectors, Schiller said, but no more. Lightning is an all-digital, eight-signal design with an adaptive interface. It's got improved durability, works using either side and is 80 percent smaller than its predecessors. 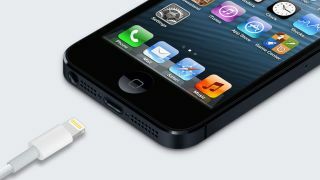 Both the new iPod nano and iPod touch will feature slimmer slots for Lightning to slip into. Don't fret, older iOS device users - Apple's created an adapter to accommodate 30-pin connectors. The cost of connecting? Pick one up for $29 (£18) and a 0.2m runs $39 (£24).